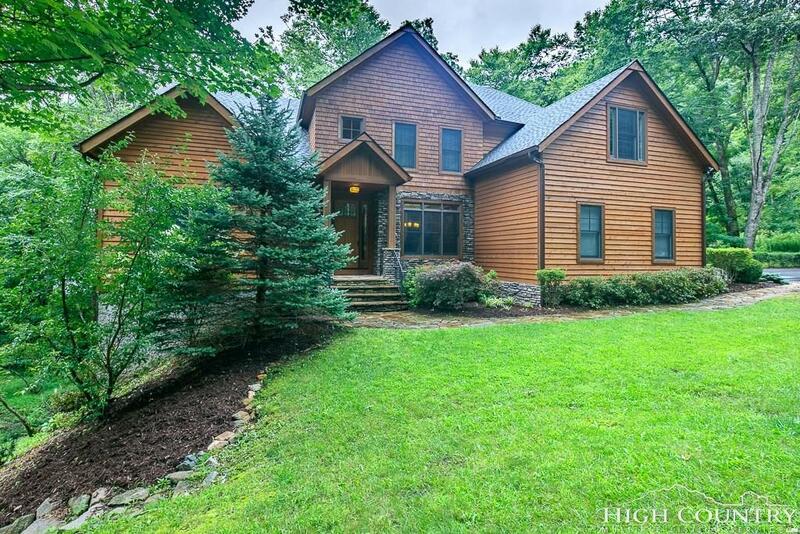 Gorgeous home in the heart of Boone. Located in Councill Oaks, a gated community of newer quality homes, this 6 bedroom/5 bath home is priced to sell and ready for new owners. This home has what buyers are looking for with two fireplaces, vaulted ceilings, 2 car garage, main floor master suite and recreation room. The open floor plan features a formal dining area, large kitchen, living room, and breakfast/sun room. Master bath has soaking tub, tiled shower and heated floors with 2 vanities. Porch is accessed through sunroom and Master bedroom. The second floor has 2 bedrooms with a shared bath and a 3rd bedroom with en-suite bath and secret room with skylight. The lower level has huge recreation room with fireplace, large bedroom and bath and additional room that could be used as an office or den. Mature landscaping with flowers greet you as you pull in to the circular driveway. Custom metal handrails on porch and stairs reflect the quality craftsmanship found throughout this home.